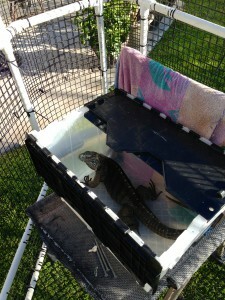 This story is just an observation about cyclura intelligence and it sure makes you wonder. 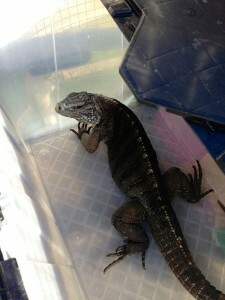 Our female cyclura Bella Blue lives inside the house. We take her outside into inclosure to get natural sunlight almost every day as weather permits. 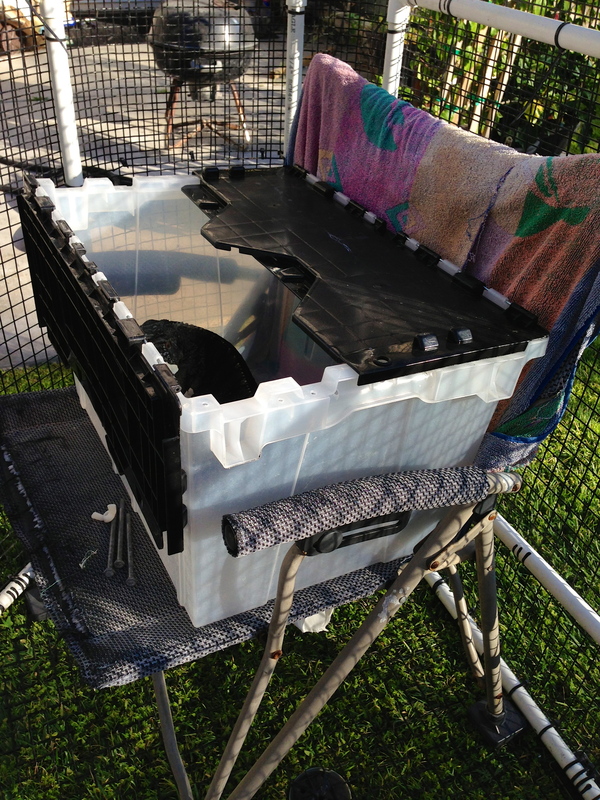 We have been using a plastic container to transfer the iguana between the house and the outside enclosure. 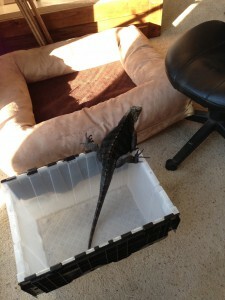 So what we do is put the iguana in the box while inside the house, close the box and carry it into outside enclosure. We release iguana from the box and let her spend the day basking in the sun. And we also leave the plastic box somewhere in the enclosure. The outside enclosure has some basking hammocks, hiding lair and a small shallow water pool. Bella Blue moves to different spots through the day. When the sun goes down and the shadows set in the yard it’s time to bring Bella Blue back home. So we go into the cage, open the box, put the lizard inside the box and carry her back home. Then, inside the house, we let her out of the box and she usually walks to her home cage on her own. Bella Blue exits the box in the evening and goes to her cage on her own. Bella Blue became very familiar with this practice and never put any resistance going into the box. But the other day when my husband Erik carried her outside and left her in the cage, he left the plastic box as usual, but on the chair and with open lid this time. In the evening when the sun was setting and it was time to bring Bella Blue home, she was sitting inside the box as if she was ready to go home. Cute. But we didn’t want to make any assumptions at this time. 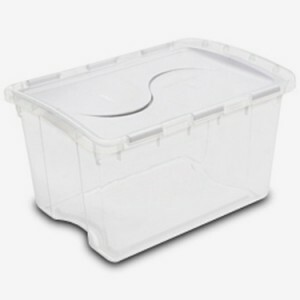 Plastic box with open lid was left inside the enclosure. The next day Erik left the box with open lid again, this time on purpose. And sure enough, she was sitting in it when it was time to bring her back home. Bella Blue is sitting inside the box and ready to come home. Since then we started to leave the plastic box open all the time and she would always be in it or near it in the evening. Very interesting learned behavior. Bella Blue has figured out what the box is for and how we were using it. The reason we are using plastic box to transfer the iguana between the cages is to prevent any accidental escape. Bella Blue is very tame and you can handle, hold and carry her. But we still choose to use the box for this purpose. You can read more here Why. Over the years of owning these amazing lizards we had witnessed their intelligence in so many instances. Cycluras are very intelligent lizards.